Boswell married his cousin, Margaret Montgomerie, in November 1769. She remained faithful to Boswell, despite his frequent liaisons with prostitutes, until her death from tuberculosis in 1789. After his infidelities, he would deliver tearful apologies to her and beg her forgiveness, before again promising her, and himself, that he would reform. James and Margaret had four sons and three daughters. Two sons died in infancy; the other two were Alexander (1775–1822) and James (1778���1822). Their daughters were Veronica (1773–1795), Euphemia (1774 – c. 1834) and Elizabeth, known as 'Betsy', (1780–1814). 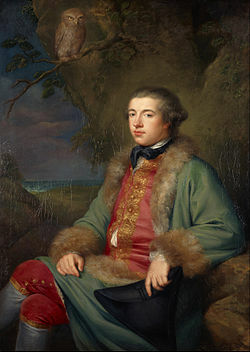 Boswell also had at least two extramarital children, Charles (1762–1764) and Sally (1767 – c. 1768). ^ Root, Douglas (2014). "Two "Most Un-Clubbable Men": Samuel Johnson, Benjamin Franklin, and Their Social Circles". In Baird, Ileana. Social Networks in the Long Eighteenth Century: Clubs, Literary Salons, Textual Coteries. Newcastle upon Tyne: Cambridge Scholars. p. 256. ISBN 1443866784. Retrieved 30 July 2017. ^ "The Enlightment and the Freemasonry". Archived from the original on Nov 13, 2018. Retrieved Nov 13, 2018. ^ "Famous Freemasons". Lodge St. Patrick No.468 Irish Constitution in New Zealand. Archived from the original on Feb 8, 2013. ^ "The Boswell family". Grand Lodge of British Columbia and Yukon. Archived from the original on 9 Jul 2012. Retrieved Sep 30, 2018.